During combat against shore batteries along the Vietnam coast, I was the CIC evaluator and spent roughly half my time during GQ on the bridge and the other half in CIC. When we were receiving fire from shore batteries I went topside to the bridge. We were the aggressor. The Captain was on the bridge. We all wore life jackets and helmets. 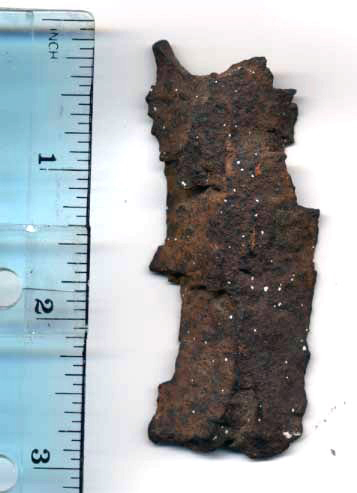 The three photos below are of a piece of shrapnel I recovered from the signal bridge in the summer of 1968 off the coast of Vietnam when the ensign was holed by an anti-personnel air burst just forward of the mast at about 100 feet in altitude. 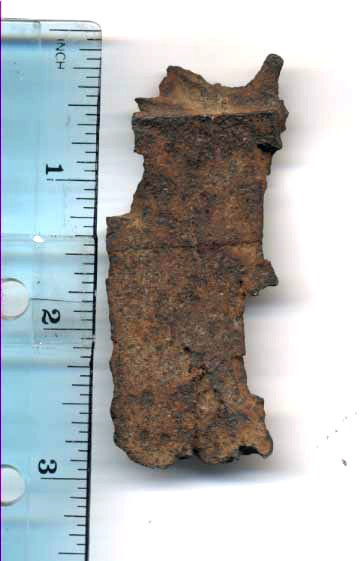 The shrapnel is about 3 inches long; it weighs about six ounces and has ragged edges which could have destroyed a man or a limb. We were at GQ during shore-bombardment firing counter-battery, so the skivvy-wavers were locked-down in the signal-hut and nobody took scars home to momma. (Counter-battery fire was required because we stirred up a nasty response from the bad guys.) We got lots of splashes port and starboard and chased them when they were not simultaneous. Chasing splashes means that we would try to move the ship to where the last enemy round landed since no two rounds land in the same place (somebody said) and since I had the conn that's what we did. They sure got at least one round near the mast, but it was either an anti-aircraft round (set to explode near an aircraft to bring it down with shrapnel) or anti-personnel round (set to explode at about 100 feet high to kill people below with shrapnel). We blew out the starboard bridge window from the concussion from Mount 52. After we completed that run against the shore batteries, we ran along the coast about 10,000 yards off shore, then turned to the open sea. We were still at GQ. I went up to the signal -bridge to check for damage. I found shrapnel on deck, but no penetrations of the hull, decking or damage to the mast or rigging. Looking up and saw that the ensign had been holed. I collected what shrapnel I saw, and told the Signalmen to replace the ensign, which they did. I took possession of that battle-damaged flag, went to my stateroom and locked it in my safe (I'm a student of history). About four days later the Skipper, John Kearny, asked me where the flag was, I was obliged to give it to him and have not heard of it since. The signalmen must have told the Captain that I had the holed ensign. I picked-up two pieces of shrapnel, I sent one to the Collett record keeper Frank Olderr and kept the other. The starboard bridge window was blown out three times by Mount 52 during my time aboard. I wore .45 pistol cartridges in my ears for protection from the blasts. It worked, my ears are still okay. I remember many of my COLLETT shipmates, some from standing quarterdeck or bridge watches or other official duties, and some from "tea" drinking ashore. From left to right: View of one side, view of edge, and view of other side. Here's my story of how it was in the forward fireroom during the time that Bill Wardell was chasing splashes. When we went to GQ we put in the size 28 burner tips that the MR had bored out from size 30 sprayer plates. When the first rounds hit the water I woke up BT3 Franklin and told him we were taking rounds from shore. He heard some more rounds hit close by and said someone is bottom blowing a boiler. He thought it was the waterhammer from water going out the piping. The 28 tips made us smoke some because we also turned the fuel pressure up to around 350 - 400 psi. We knew the MM on throttles was not going to want anything but steam. We took pride in the fact that we supplied the steam to keep the ship alive. I'm still proud to have served on COLLETT.